The Red Kettle campaign is a major fundraiser of the Salvation Army, and the weekend of Black Friday was an important couple of days for the effort. 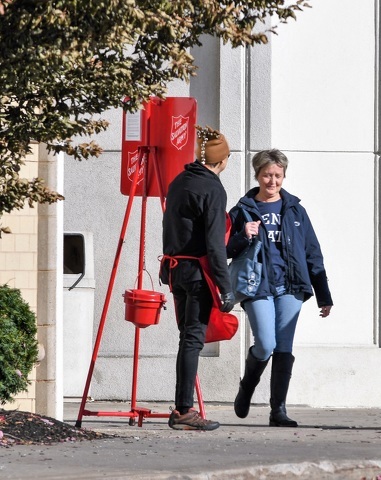 Pictured here is a Salvation Army bell ringer bringing attention to the red kettle at the Nittany Mall, a very popular site during the holiday shopping season. STATE COLLEGE— It’s not much of an exaggeration to say that the Salvation Army runs in Lt. Staci Ferreira’s blood. The new head of The Salvation Army of State College is the seventh generation of Salvationists in her family. Her parents are Salvation Army ministers, her grandparents are retired Salvation Army ministers, and Ferreira has been a fully ordained minister for the Salvation Army for five years. In June, Ferreira was appointed as administrator and lead pastor of the State College Corps. “I grew up in the Salvation Army,” Ferreira said. “I just can’t see myself doing anything else. The kettle workers she referred to are the volunteers who help with perhaps the most familiar Salvation Army program, the Red Kettle campaign, which happens every year during the holiday season. “Our annual Red Kettle campaign is our major fundraiser. It accounts for the majority of our budget each year. That’s the money we use to help people with their utility bills, rent or whatever it is that we can assist with,” Ferreira explained. The Red Kettle campaign is currently in full swing, and the Salvation Army is in need of help. At this time of year, the Salvation Army is also busy with its annual Angel Tree ministry, which Ferreira estimated will help more than 100 local low-income families this year. While the Salvation Army may seem to be most visible during the Christmas season, Ferreira wants the public to know that the organization continues its work all year long. In the summer, they collect school supplies and clothing for their Back-to-School program. As with the Angel Tree program, parents sign up and qualify based on income. A relatively new program for the State College Corps is their homework help program. The program is available to all students in grades 1-12, and it is free to participate. It takes place on Tuesday evenings at 5 p.m. The program is on hiatus for the month of December, but will resume in January. In addition to the services it provides to the community, the Salvation Army holds Sunday school and worship services every Sunday, as well as weekly Bible studies and other activities found in most churches. Ferreira served as an assistant corps officer in Pottsville and in Philadelphia before being assigned to the State College Corps. The Salvation Army of State College is located at 2603 E. College Ave., Suite G. For more information, visit facebook.com/SalArmyStateCollege or call (814) 861-1785. To sign up as a volunteer bell-ringer with the Red Kettle campaign, visit redkettlevolunteer.org.